« Do It Yourself Exadata Performance! Really? Part II. 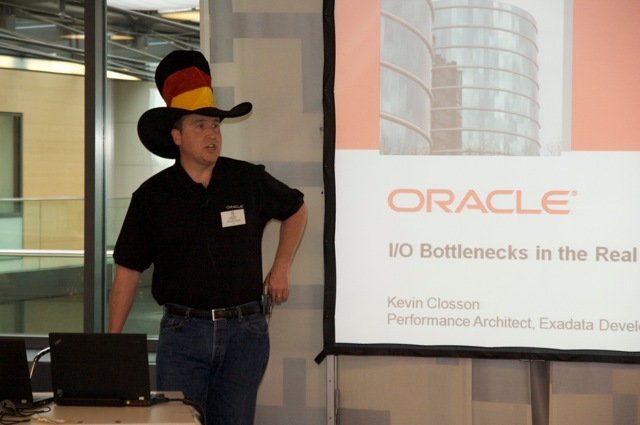 Do It Yourself Exadata Performance! Really? Part III. I just noticed that the vote count for my Oracle Mix Suggest-A-Session is up to 92! I’m flattered and thanks for the votes, folks. I promise this is the last post on this thread! The session I aim to present has some content that I delivered to our EMEA Sales Consultants during an event we had in Berlin back in April. I did that presentation during one of our one evening sessions and was surprised to find that one of the attendees took a photo of the costume I chose. Perhaps I should have saved that hat for viewing any World Cup games featuring team Germany?